Possibly one of my favorite lunch situations these days. It’s quick, easy and oddly satisfying. 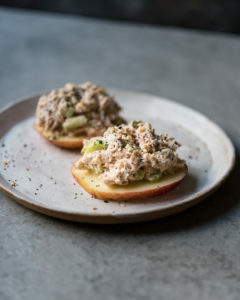 And with those sweet and delicious honey crisp apples in season, this Open Faced Tuna Apple Sandwich is about to be your new go-to light lunch or snack. I like my tuna salad really simple and with texture. I don’t go crazy with the mayo and I love a little crunch. I used to add diced apples in the tuna salad, and one day got lazy only to discover my new favorite creation. If you haven’t tried the tuna/apple thing, I promise you’re missing out. The sweet crunch of the apple is the perfect contrast and match all at the same time. So if you’re looking to lighten up your lunches a bit, I hope you’ll try this recipe. This easy Open Faced Tuna Apple Sandwich makes a great healthy lunch or snack. Add the tuna, mayonnaise, salt and pepper to a bowl. Use a fork to combine well. Add a little more salt to taste. Squeeze in a little lemon juice and mix in the celery. Serve on top of sliced apple and sprinkle with Everything but the Bagel seasoning. What kind of tuna do you use. I have been finding tuna to be very fishy. I used to only use Bumble Bee white tuna in water but that has been fishy and not pink and soft.